mounted, valve or transistor, we can service it! Amplifiers do not normally have a set maintenance schedule. The signs your amp may need servicing can be anything from a noticeable degradation of sound to a noisy cooling fan. In our experience most servicing related enquiries are prompted by the presence of a fault, this could be down to a suspect valve that’s gradually got worse & causing concern, or maybe just scratchy noisy control pots! Guitarlodge have over 25 years experience in amplifier servicing. Our check-list of procedures includes Inspection & testing using high quality calibrated instruments, along with valve testing, biasing, selection &/or replacement (if required), specialist electronic component cleaning & necessary maintenance repairs. Safety is something we take very seriously, electrical safety checks, PAT tests & detailed work reports are included as standard with every amp we service. Requirements vary between models but any amp that uses valves will need additional & more frequent attention compared to its solid-state counterpart. Valves & their associated control components run at voltages ranging between 300-450 VDC generating considerable heat & we strongly advise occasional inspection. There’s no doubt that sound degradation can be a gradual process & servicing can often transform a tired overworked amp! All work including any necessary additional repairs are covered by our guarantee (see terms & conditions at bottom of page). Servicing case studies can be viewed in the gallery. . If you are contacting us about having your amplifier serviced or think it may have a problem & you require advice, please help us by giving details of make-model & an accurate description of any symptoms. Certain symptoms can be a sign your amp is in need of servicing, particularly on valve equipment. As always it is better to arrange an appointment at our repair centre (whenever possible) where we can discuss your servicing & maintenance needs in greater detail. No-obligation quotes are only given in certain cases & any pricing details for our amplifier servicing should be used as a guide only. Please see our terms & conditions (bottom of page) for information on after sales support, labour charges & turnover times. Initial general inspection: Amplifier fully assembled as taken in (power off). Check for secure earth & mains connections, correct fuse ratings, broken or unsafe handles, missing castors, grills, guards & check general structure for safety. (Power on) check for failed or missing power & standby lamps, cooling fan noise, speaker condition (If fitted), abnormal sounds or noises during operation including vibration, hum, hiss, feedback etc. Inspection stage 2: Amplifier chassis removed & vacuum cleaned (power off). Checks include: Looking for damage to components from overheating, chassis condition, signs of damaged wiring, loose components, evidence of corrective work on past faults, visible dry joints, discoloured valves/bases, cracks or tracking on PCBs. Testing: Amplifier chassis removed (power on). Tests include: Checking for correct operating voltages at key test points in circuits, quiet/correct function of potentiometers, switches, cooling fans & other controls. Locating dry solder joints, bad connections, overheating components & faulty or microphonic valves. Valve testing & replacement: We check every valve (preamp & output stage), on a stand alone calibrated tester. Output stage valves including EL34, 6L6 & 5881 for example, work a lot harder than preamp spec types (ECC83, 12AX7, ECC81 etc) & often require replacement during a service. Preamp valves do fail also & symptoms can include unusual feedback, squealing, hics or squeaks. We will always advise on & recommend replacement valve types during the servicing process if necessary. Checking & setting the valve bias: (Valve grid control voltage) an essential procedure when servicing valve amps, especially if new valves have been fitted. This small crucial adjustment has a direct influence on the valves gain structure, function & lifespan. The bias setting controls the idle current to the valve grid, ensuring the valves run smoothly within their intended operating conditions (applied DC voltage & current). Tampering with the bias in an attempt to change the sound characteristics of a valve amplifier is not advisable! Cleaning components: All valve amplifiers attract dust & dirt due to airflow venting. Cleaning is essential during a service & enables us to eliminate the possibility of faults caused by dirt, grime, corrosion & moisture. Certain components that we pay particular attention to using specialised electronic cleaning products include potentiometers, switches, various connections, valve bases, cooling fans & jack sockets. Minor fault repairs: Servicing on any type of amplification invariably involves the odd minor repair. Dry joints, bad connections, incorrectly rated fuses etc are normally located & fixed during the testing stages & often included within the cost of the service. In the event of multiple or less obvious problems arising requiring additional labour time, fault finding and/or replacement of costly components, extra charges will apply. Second test: Amplifier chassis removed (power on). Once all the required servicing procedures & any necessary repairs have been carried out, the amplifier is tested one last time before re-assembly. All operating functions are tested, voltages re-checked & valve performance monitored. Assembly & final tests: The amplifier is fully assembled & tested under normal operating conditions for a set period, connected to a matched speaker if required. During this phase we are checking between channels (if applicable), for stability of sound levels, vibrations, hums, tone changes or new faults. PAT test: We always include a PAT test during the final stages of testing. Ultimately your safety is our highest priority! Full report: A full detailed report is completed with every amplifier we service. This includes amplifier serial & model numbers, detailed test results including faults located, components cleaned, faults repaired, parts used, safety advisory warnings, PAT test results & a breakdown of all costs (parts & labour). Amplifier servicing: Charges, terms & conditions. 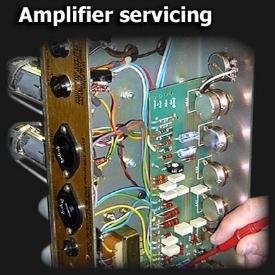 Charges: Our rates for servicing amplifiers are £30 for the first hour, this is our standard minimum bench fee for all amp related repairs-servicing & then £25 per hour there-after. As a rough guide, to strip down a typical valve amplifier (Marshall, Laney, Mesa Boogie etc) & carry out the servicing procedures listed above requires approximately 2 hours labour. We cannot give accurate quotations on servicing, as no two amplifiers needs are identical. Labour rates include any minor parts & small repairs that may be required. Larger items like filter capacitors & valves etc are not included. We offer competitive prices on these & other amp parts. Your budget: We promise to only charge for the labour time & parts necessary to service/repair your amplifier. Whilst we cannot give estimates for this kind of work very easily as so many variants make it difficult, we will always advise honestly & discuss (if need be), the possibility of high costs. We will never surprise you with a hefty bill. Turnover times: Servicing can normally be completed within a couple of hours (Guide only) providing there are no major faults that need attention. However we recommend allowing a week between drop off & collection just in case additional unexpected work is required &/or specific components need ordering. Although we stock many spares, certain parts still have to be ordered. If we cannot meet the agreed turnover time for any reason we will contact you.